Hetq.am, a popular investigative news source in Armenia, has published an article covering the role of blogs in delivering information during the state of emergency in Armenia in March 2008. This blog is also mentioned. Our friend Artyom has finally updated his blog – iArarat – and posted information on Turkish attempts to claim that Native Americans are Turks. The latter theory, although with apparent roots in early Kemalist fabrications that the entire world civilization (with the exemption of unimportant Armenians, Jews and black Africans) was created and influenced by the Turks, is hoped to convince politicians of Native American descent to lobby for Turkish interests – that is to deny the Armenian Genocide. After a friend of mine from Amsterdam thanked me yesterday for my latest article on the destruction Djulfa, I promised him never to forget Djulfa and not let others forget it either. As part of my promise, I just set up www.djulfa.wordpress.com. Linking to our April 25, 2007 update, Human Rights Archaeology reminds that the Kurdish newspaper that reported in Fall 2006 the finding of the mass grave was closed down, and Swedish researcher David Gaunt wasted an entire week in Turkey just to find out (and soon refuse further cooperation) that the possible Armenian skeletons had been cleaned up by official Turkish historians. Hardy’s post confirms that the mass grave has been destroyed. Here are some excerpts from the post. This post followed a visit to the formerly Roman family tomb, latterly Armenian mass grave, recently destroyed and covered up by the Turkish military with the help of the Turkish Historical Society. I visited my first mass grave today, my first nationalist-archaeologist-allied-with-the-military-destroyed mass grave, too; now that‘s negative heritage tourism. It was the allegedly – to me, fairly definitely – Armenian (or other Other) mass grave in Kuru/Xirabebaba, for the reporting of which Ülkede Özgür Gündem was shut down and on the excavation of which David Gaunt refused to work. All of the Roman resting places seemed empty and all of the diagnostic bones from the top of the stack in the centre had gone; only a few long bones and one jaw fragment appeared to have remained. If it were natural factors that had reburied or degraded “all” of the remains after the reopening of the tomb, it [they] would have to have been exceptional conditions, to have covered the material on top without covering the material beneath that, or to have been such caustic rain, etc., to have decomposed the material on top entirely without leaving any identifiable wear or residue on the material beneath. When I had discussed the burial site with locals, they had been divided on whether they thought it was a mass grave or not. A few of the men who thought it was a mass grave said that it was destroyed to hide the evidence and commented that, ‘that’s what they’re doing to us’. The logic of the “impartial joint excavation” of the mass grave falan falan falan is similar to that of the “impartial joint commission” on the history of the Armenian Genocide. It is different though; beyond the futility of a joint commission with deniers who aren’t scientists anyway, the erasure of the evidence puts scientists in the position of helping their opponents “prove” their case by their inability to prove their own. The largest circulating worldwide Armenian Magazine, AGBU, makes mention of my film on the Djulfa destruction in its current, April 2007, issue. Titled “Internet Video: Making the Local Global,” Hrag Vartanian’s article tells of the videonet revolution and its Armenian connection. One veteran filmmaker, Ted Bogosian, was approached by Hollywood bigwig Danny DeVito to be part of a new movie portal called Clickstar (cstar.com). Run by actor Morgan Freeman’s company and sponsored by Intel, Clickstar was launched last December. It allows users to have a more flexible movie experience by offering the ability to download movies either to rent or own, 24 hours a day. YouTube is quoted as saying the video giant will “remain committed to working with authorities in Turkey to address any concerns that they may have,” given a recent ban of YouTube by Turkey after a Greek video “insulted” Turkey’s founder Ataturk by calling the latter homosexual (the video was removed by YouTube). If the chance for abuse on YouTube is possible, others are utilizing the service for cultural or social activism. 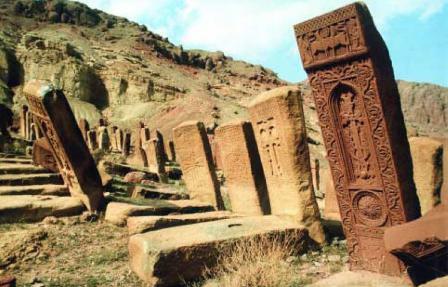 One Armenian blogger, Simon Maghakyan, posted a short documentary about the 2005 destruction of the medieval Armenian cemetery of Djulfa in the Azeri-controlled region of Nakhijevan, The New Tears of Araxes-a story he was the first to spotlight on his website, Blogian.net. “It took two months to create, and I had no idea how to make a video,” Maghakyan says. “I received financial help from a non-Armenian foundation to purchase the satellite image used in the video. A scriptwriter helped, and I had someone lend a hand with the soundtrack.” Since its posting it last December, the five-minute video has received 8,000 views on YouTube and an additional 1,000 views on Google video-a competing site.